Barnes & Noble introduced the Nook Tablet, a new $249 rival for Amazon's Kindle Fire tablet. 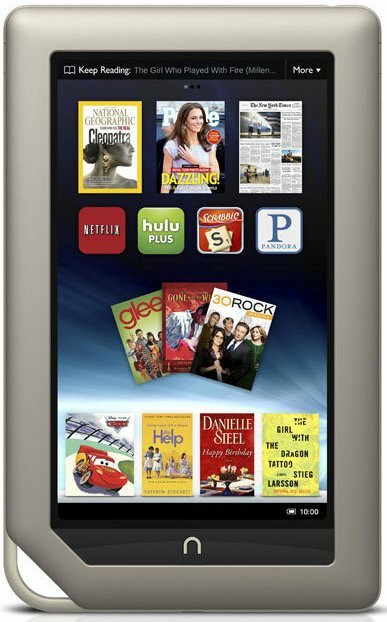 This new product is an updated version of the 7" Nook Color, it features a 1GHz dual-core TI OMAP4 CPU, 1GB RAM, 16GB internal storage capacity, and a SD memory slot to expand the storage capacity by up to 32GB. More details at Slashgear. One of the biggest bits of news surrounding this release is the fact that while it, the NOOK Tablet, will be set at the $249 price point the NOOK Color had been at, the NOOK Color will be cut down to $199, this setting it right in line with the Kindle Fire, a device which has been known to have been compared to the NOOK Color upon its first reveal. Additional benefits of this new tablet include free Cloud Storage with Barnes and Noble (“Nook Cloud”) and the promise of an ultra-light under-a-pound chassis.